David Jones CMO, David Robinson, sees his role as one of business leadership and collaboration as much as marketing strategy. Given his 18-year history with the retailer working in “every nook and cranny of this business”, it’s an unsurprising answer. 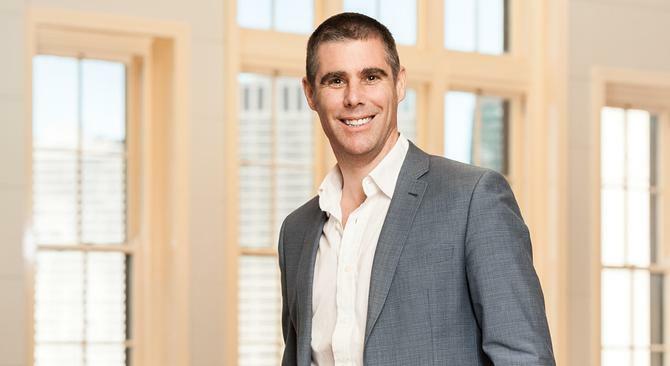 For the past two years, Robinson has been leading a transformation of David Jones’ marketing function, using customer insights, digital channels, content and data as his tools for change. Before this, he developed and led the retailer’s omni-channel retail (OCR) strategy, reporting directly to the CEO and working in collaboration with IT, marketing, merchandising and operational teams. Today, David Jones has the majority of its brands available online, offers a variety of delivery options and payment methods, and claims digital has become the most profitable ‘store’ within its portfolio. Out of this program of work, it became apparent marketing also needed an overhaul. When Robinson took up the CMO post, marketing in David Jones was traditional, limited and lacked a digital and data backbone. “We had one customer segment, which was the David Jones customer, because everyone shopped at David Jones,” he says. “And we had three channels to market: Catalogues, TV and press ads. Robinson outlines four key pillars to his marketing strategy. The first is taking a digital-first approach. This year, more than 50 per cent of the retailer’s marketing spend will be on digital. The second pillar is integrated channel activities, targeting key customer segments his team has spent a huge amount of time defining and understanding. To help, Robinson removed channel-based responsibilities within the team. The fourth component is data and insights. To make this a reality, David Jones has embarked on a three-stream exercise designed to get to know its customers, and where opportunities exist for growth. “We understood 6 per cent of our customers, or 20 per cent of sales, made by our AMEX/David Jones cardholder customers, very, very well. But we didn’t necessarily understand the other percent of our customer base,” he says. To do this, Robinson and his team embarked on an extensive customer research and insights exercise. He outlines three main buckets of data insight: What’s happening in-store, what’s happening outside the store with core customer segments, and developing a loyalty scheme that allows the retailer to have a one-to-one relationship with a customer. “We’re working on a loyalty scheme, which will enable us to develop that one-to-one relationship,” he says. “We have done an extensive amount of research both with David Jones and with the four Country Road group of brands [Country Road, Witchery, Trenery and Mimco], and across all our customer segments within that. We have done a significant amount of qualitative research, as well as two rounds of quantitative research. In the meantime, David Jones needed to concentrate on tapping in-store and outside market insights, Robinson says. “Firstly, we went to our point-of-sale data… We spent time looking at every single transaction, understanding how often our customers came in, what they purchased with what, and developed a customer profile of frequency, spend, of purchases,” he explains. This provided the basis for David Jones’ customer segmentation approach. Robinson says it then went to data insights consultancy, Quantium, to top up its knowledge. Initially, this involved delving into credit card information to develop a profile of the customers in-store in terms of age, demographics and background. These insights were then combined with POS data and external market insights from Quantium to understand where core segments of customers were shopping when they weren’t at David Jones. “This helped developed a really clear picture of what our customer base looked like and how they shop with us,” Robinson says. “More importantly, we can use that in two ways. Our merchandise team has used it to develop a 16-box grid, which looks at both a value spectrum, and a style spectrum. The work took six months, but validated who David Jones’ core customer was – and it was a younger customer than many thought, Robinson claims. “Historically, if the grandmother shopped at David Jones, the mother then shopped at David Jones so the daughter would shop at David Jones. The question I posed to the board four years ago was what happens if she doesn’t? The retail landscape after all has changed so much,” he says. Similarly, David Jones’POS data highlighted specific segments of customers worth targeting, such as the ‘considered shopper’ and ‘fashion butterfly’. Data insight initiatives continue, and Robinson says David Jones has just completed work on one customer segment to understand what purchases they made inside David Jones and importantly, what they’re not buying. “We also know a majority of those brands are ones we stock, so there’s the opportunity,” he says. Turning this into a transaction, however, is not just a task for marketing, it’s a whole-of-business capability. “It’s everything from simply communicating that insight to the area on the floor where the people they purchasing, so staff know there is a proportion of that customer base that isn’t going to visit another part of the store, to the way we do offers, the way we merchandise and sign those offers in store,” Robinson says. This belief in whole-of-business change is apparent in David Jones’ approach to digital strategy and capability. While Robinson admits his previous role was much like being a chief digital officer, he says David Jones made a conscious decision four years ago to integrate digital into business-as-usual. “If you look at our omni-channel strategy, buyers buy across all channels, operations are accountable for servicing the customer across all channels, IT is accountable for having the systems stay up across all channels, and marketing is responsible for taking our brand to market across all channels,” he says. “That by definition means the executive committee is accountable for our digital transformation across every channel. David Jones is about to go through phase two of its digitisation efforts. In recent years, the retailer has invested in foundation technologies for its omni-channel approach, including a new POS system, order management system, Web shop, and warehouse management system. Robinson says it’s now looking at further systems to improve retail management and to pull it all together. “We’ll then have a single view of customer that we need to plug in as part of the loyalty campaign management. So work doesn’t stop,” he says. And David Jones is claiming the work is paying off. In its last year’s financial result, the first under new owners, Woolworths Holdings, sales were up 6.4 per cent, and Robinson points to ongoing quarter-by-quarter growth. One of the ways this change is being demonstrated to customers at the front-end is marketing’s more collaborative content and people-driven approach. Robinson says David Jones continues to rely on the same brand characteristics - bold, energetic, modern and sophisticated – but is achieving this through more collaborative content. A recent example was the retailer’s #Shotbysound Spring/Summer Fashion Launch campaign, in collaboration with Australian musician, Daniel Johns. Another program example he points to, #itsinyou, sees David Jones collaborating with seven well-known Australians to highlight the importance of people to its brand. It’s also designed to emphasis what the brand represents to customers, from confidence to empowerment and individuality, Robinson says. Among the ambassadors involved is former Sydney Swans player, Adam Goodes, to display power. The move to work with Goodes sparked a furore of negative and positive comment on social media, but Robinson stands by its decision. Goodes’ role with David Jones will also see him part of a wider corporate social responsibility effort. Coined the ‘goodness movement’ by more than one media commentator, the activity illustrates how brands are striving to not just stand for themselves, but a broader community purpose. At David Jones, Robinson calls this the company’s “good business journey”, and notes its 20-year partnership with the National Breast Cancer Foundation as an example of efforts in this space. He adds great brands have a responsibility to lead. “We have a real heritage in good business journey, but we want to expand that and ramp it up, and we talked with Adam… about the fact that we want to develop a reconciliation action plan. How should we develop that respect, engagement and opportunity with indigenous Australians,” he says. Throughout all of this work, Robinson says the attributes he’s relied on as CMO are the same as those required in almost every senior role in business. “You need critical thinking and to know where you’re going; you need to be able to communicate and tell people why and how they’re going to get there; and you need collaboration and working with colleagues to get there,” he says.